Indian Gifts Portal, the leading online shopping website, has announced some astounding deals and offers on its exclusive rakhi gifts collection. 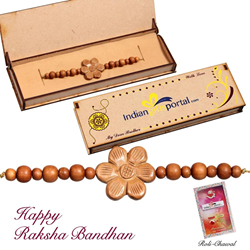 Indian Gifts Portal is doling out exclusive one-time deals and offers on its new rakhi range. The eCommerce website has promised to make this year's Raksha-Bandhan extra special for its customers across the globe. The website is offering a special 67% discount to its customers, along with an exclusive range of rakhi products under ₹499 and ₹999. Indian Gifts Portal is offering free shipping to its customers based in India and overseas. The eCommerce website caters to clients from all across the globe, especially from USA, UK, Canada, Australia and UAE, among other countries where Indian families have settled. The website is also offering the choice of same day delivery to various destinations. The deals and offers plus the free online shipping to so many destinations, is a great combo in itself and is making the website a favorite destination of world-wide customers. Also, the guarantee of the safe, fresh and timely delivery has assured the customers of whether they order non-perishable items like rakhis and gift items or order perishable goods such as Mithais and Ladoos, they won’t miss the happiness and joy of this auspicious festival of Raksha-Bandhan. Indian Gifts Portal is a prominent online gifting website that enjoys being one of the most favorite websites among its customers. With years of experience and trust in gifting industry, Indian Gifts Portal has made many events and occasions a memorable part of millions of lives. IGP is among the most visited Indian e-commerce websites and one of the largest online gifting and shopping portals. Customers claim it to be a perfect gift shop for every event and occasion.